This entry was posted on October 15, 2015 by Tinteán Editorial Team/EMcK, in entertainment, Irish Culture, News, Of Musical interest, Popular Culture, What's On... and tagged Byrne and Kelly, Celtic Thunder, Irish culture, Irish music, Live Music. Bookmark the permalink. Award winning singer songwriters Neil Byrne and Ryan Kelly of Celtic Thunder fame will be making a much anticipated return to Australia in October for a national tour that has been enjoying rave reviews in the US. 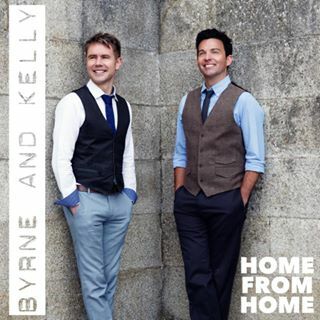 Aside from their Celtic Thunder fame, Byrne and Kelly have been touring their show since March 2010 and have become known for their unique style of alt-folk, performing in such venues as The Great Hall – Toronto and Berklee College of Music – Boston. Their show is packed with incredible guitars, fiddle, mandolin and superb vocal harmonies. This time around the pair will be joined by Nicole Hudson on fiddle and backing vocals and Conal Early on keyboard, guitar and mandolin. Their set list will draw from Byrne and Kelly’s debut album Acoustically Irish which took the Billboard #1 World chart position and #1 World Album on iTunes in the US, Australia and Canada plus Live in Australia, which was recorded live at The Vanguard in Sydney in June 2014 and promptly became the #1 World album on Billboard, iTunes and Amazon. Through classic Irish storytelling, Byrne and Kelly deliver music that is both uplifting and beautiful reflecting on their childhoods growing up in both North and South of Ireland and their experiences travelling the world playing music. Driven by vocal harmonies, they effortlessly merge genres such as traditional Irish and Americana to achieve a fresh, original sound. Their new single called Home From Home has just been released worldwide. Here’s a sneak peek!